This Easter confection from Universal and Illumination Entertainment is fun for every member of the family, despite marketing that suggests it may be intended for only the youngest of the bunch. The story of the Easter Bunny's teen son and his quest to make a name for himself is richly funny and entertaining. This wonderfully clever, hip hoppin' delight will be loved by believers of all ages. The slickly produced combo of live action and animation is targeted for rolling spring breaks through April and should be able to fill its basket with tons of dough and a good shot at repeat business. It will also be a holiday perennial on DVD. Director Tim Hill was behind the camera on Garfield: A Tale Of Two Kitties and Alvin and the Chipmunks, both live action/animation mixes that paved the way for this contemporary family comedy/fish-out-of-water story. Hop revolves around 17-year-old E.B. (voiced by Russell Brand), son of the Easter Bunny (voice of Hugh Laurie), who's meant to take on the Easter tradition of delivering candy baskets, but he's terribly conflicted about his assignment. On the eve of the big holiday he hightails it out of Easter Island to Hollywood to pursue his dream of becoming a drummer. There he meets Fred (James Marsden), a twenty-something slacker who was just thrown out of his parents' house. Faking an injury and stunning Fred with his ability to talk, the savvy bunny convinces the ne'er do well to take him in. Meanwhile, back in Easter Island's candy factory, second in charge Carlos (Hank Azaria), a fat yellow chick, takes advantage of the crisis by plotting a coup. All of this eventually leads E.B. and his new human friend back to the factory to try and save Easter before it's too late. Hill effortlessly blends state of the art CGI with winning animation. Screenwriters Cinco Paul & Ken Daurio and Brian Lynch dreamed up some very funny bits, particularly one in which Fred and E.B. improvise a ventriloquist act to maintain E.B. 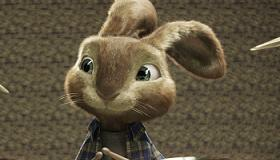 's cover as an ordinary rabbit. Marsden is the perfect foil for all of this and creates a charming rapport with the bunny while trying to convince people he's not off his rocker. Among the live action actors, Gary Cole, Elizabeth Perkins and Kaley Cuoco are fine as Fred's immediate family members while Hank Azaria is masterful as the voice of Carlos, and Laurie brings dignity to the elder Easter Bunny. In a hilarious cameo, David Hasselhoff turns up as the star of his own American Idol-style show, "Hoff's Got Talent," where E.B. lands his big TV audition. There's also a nice sequence with E.B. filling in as drummer for the unsuspecting band Blind Boys Of Alabama. Technical credits are first rate across the board and prove those singing Chipmunks have nothing on these chicks and one very cool bunny.